Larry Vanty is the Urgent Care Physician’s Assistant at our Boise 23rd clinic. He has worked at Terry Reilly for almost a year, serving urgent care complaints such as cold and flu, strains and sprains, and immunizations, as well as overflow primary care patients experiencing hypertension, diabetes, and other medical issues that won’t fit into the traditional primary care schedule. 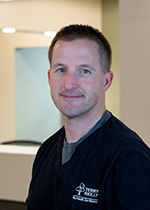 He has a background in emergency medicine, working for 20 years as a paramedic before spending 5 years working in the ER at St. Al’s, the Cascade Medical Center, and the VA. Because of this experience, he enjoys working in Urgent Care at the Boise clinic where he appreciates the challenge of never getting any heads up regarding what he will see in any given day. When Larry is not at work he enjoys spending time with his wife who he met in Oregon when they were partners as a flight nurse and flight paramedic on the same helicopter. They enjoy traveling and hiking along with their dog, and spend a lot of time in Stanley, Salmon, and on the Coast. Larry’s favorite spot they have experienced is Nepal where they hiked up to Kala Patthar at 18,000 feet. They have also traveled all through Central and South America, the British Virgin Islands, Canada, and many more destinations.